During my stay in Paris, I saw a friend and fellow artist, Francis van der Riet, for a walk through Paris and a coffee. 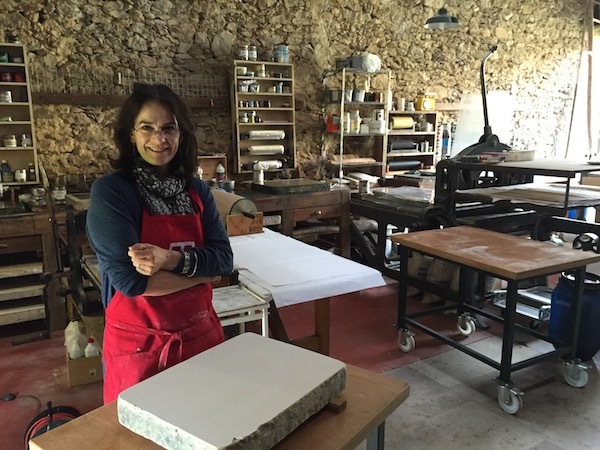 After expressing my interest in learning more about lithography, Francis very kindly invited me to his studio, Atelier Grand Village, to have a look-see at the Atelier where he practices the art of stone lithography. So after a wonderful train ride and leisurely drive through some amazing villages of France we arrived at Atelier Grand Village. Remote and picturesque, it is a delight of large open fields and stone cottages and barns. 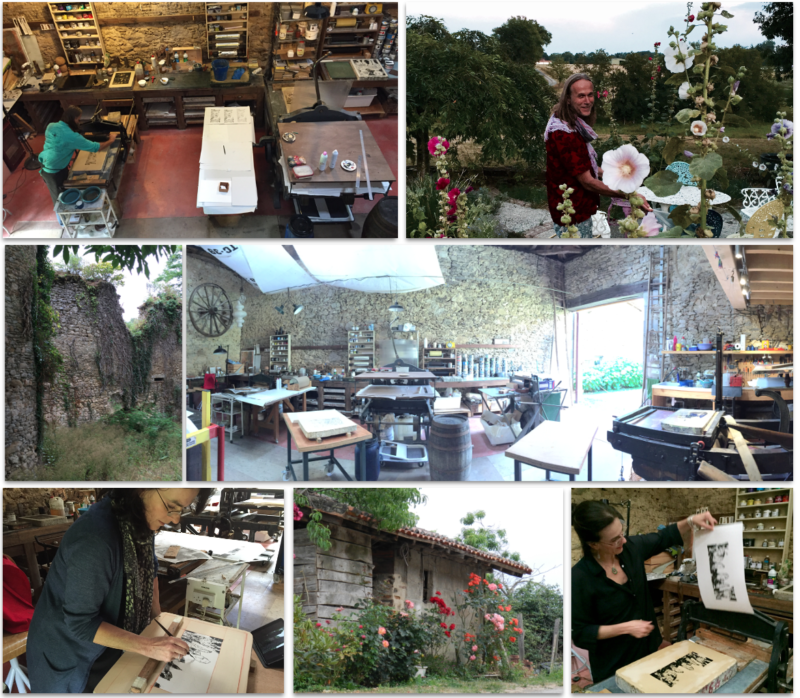 So for three blissful days, Francis took me step by step through the process of lithography. 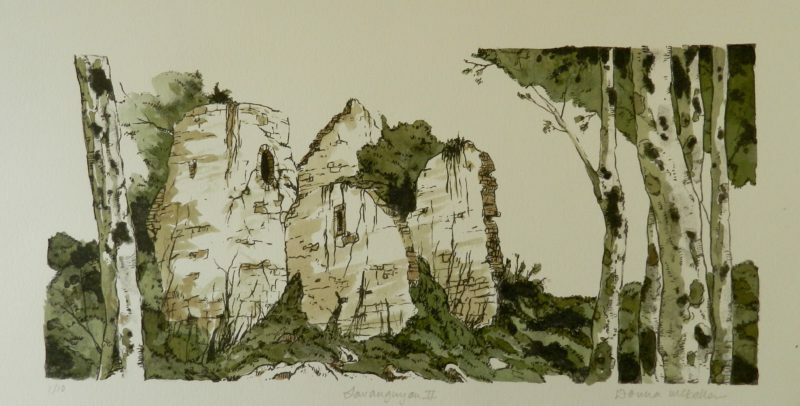 Knowing I love ruins and derelict castle type buildings, Francis took me to Lavauguyon, a ruin close to Grand Village, which gave me some inspiration for my drawings. Stone lithography is a lengthly process of grinding stones, and grinding stones, and then grinding stones…. then drawing onto the stone in various inks and with various tools. When the drawings are ready we went through the process of etching into the stone and inking them up for printing. Francis is a master at his trade and filled my head with so much info (sadly not all retained). I loved it and produced two lithographs of which we were even able to print a few editions. 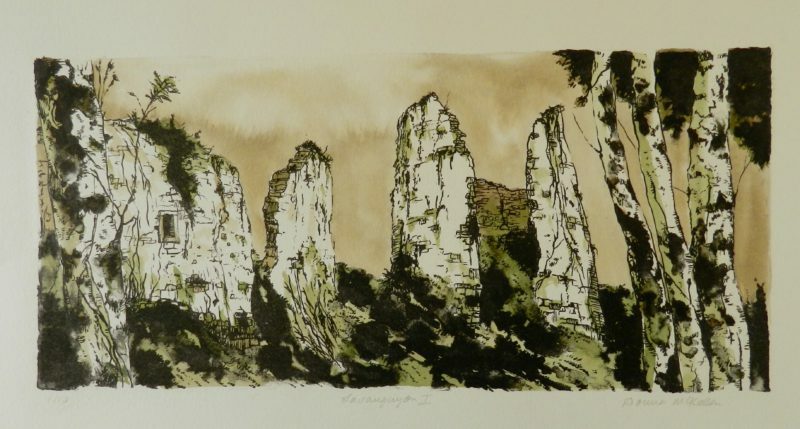 Francis has kindly invited me back and I hope to find the time to return to this wonderful village and pursue some more ideas and continue the exploration of stone lithography to expand and enhance my artistry and interpretation of my themes. My deepest thanks go to Francis and his partner Come, for an amazing stay filled with inspiration, delicious food and fabulous company.